Projects Abroad is pleased to announce that it is moving to its very own new camp within our study area of Kwa Tuli reserve in Botswana. 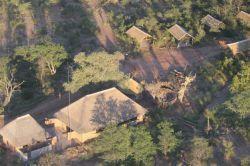 We have named our camp ‘Motswiri Camp’, motswiri is Setswanan for Leadwood. Given that we are based in Setswana land and our new common area is shaded by a Leadwood tree we thought it would be an appropriate name. The Leadwood tree is one of the largest trees in Africa and has numerous traditional medicinal uses, as well as a many spiritual beliefs surrounding it. The new camp will allow our staff and volunteers to have more areas to relax and enjoy a ‘braai’ (traditional BBQ). Most importantly, we will have a new office from which to conduct our research. As Motswiri camp is located closer to the village of Mathathane, we will have some signal for communications, which will be new for our staff and volunteers. This will make logistics easier and allow us more time to devote to conservation! Motswiri camp is based in a section of the Kwa Tuli reserve that is home to several hyena clans, leopards and of course elephants. During construction of the camp, we had a few surprise visits from these creatures and they will no doubt be regular and popular visitors in the future!